Persephone in Oregon has been published as a fine-art hardcover book and as a six-part Amazon digital and paperback fantasy fiction/mythology/nature photography Kindle Reader series. Each installment of the series forms a chapter in the book; each chapter correlates to one of the four seasons of the year, with two added chapters for a New Moon and a Blue Moon. All phases of this timeline are illustrated by photographs that are also arranged in an online gallery of pinakes. BOOK. Persephone in Oregon: A Photographic Journey Through Time tells the classic story of Persephone through the seasons, as she travels across primeval Oregon on Lunar and Solar time tables, visiting and staying in strange and mythical locations known to very few people ever, and rarely indicating any human presence to this time. 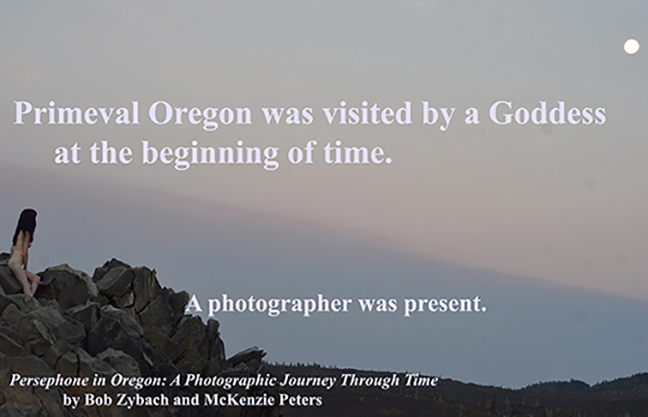 This story is told in the form of texts illustrated by 45 fine-art photographs depicting the landscapes, wildflowers, and great trees of Oregon in all four seasons over an entire year. The book is printed with the finest-grade available color inks and paper, features 45 digital fine-art 9-inch x 7-inch photographs, hardbound, 8.5-inch x 11-inch landscape format. SERIAL. Persephone in Oregon has also been published as a six-part fantasy fiction/mythology/coming-of-age digital fine-art photography series of Amazon Kindle e-books. Each Kindle Reader installment of the series forms one of the six chapters in the book. Each chapter correlates to one of the four seasons, with two added chapters for a New Moon and a Blue Moon. GALLERY. Each of the photographs chosen to tell Persephone's story is part of a series of two or three additional pictures that add context or change perspective. These additional images, in addition to those appearing in the book, can be individually purchased as full-sized (11" x 17") 300 dpi (dots per inch) PDF files, as top quality color prints, and/or as collector quality archival ink photographs. This is the story of Persephone, who arrives in primeval Oregon from the sea, blue-haired and naked in the late afternoon of a New Moon. Here she finds an Eden-like country of great ferns and grasses, waterfalls, rivers, and giant forest trees -- but no flowers, no animals, no people. This book of photographs follows Persephone through the seasons, as she travels across Oregon on Lunar and Solar time tables, visiting and staying in strange and mythical locations known to very few people ever, and rarely indicating any human presence to this time. As with her Grecian namesake and forebear, Persephone first lives in a beautiful and peaceful nature, ultimately eats a forbidden fruit, becomes personally responsible for widespread misery and death, spends several months in Hell, and becomes obsessed with spring flowers and the seasons of the year. In common with her biblical counterpart, Eve, she also encounters a Talking Snake who gives her unsettling and life-changing information. This modern allegory is told in words and in fine-art photographs that stay true to both Greek and Christian mythology and to the generally unknown beautiful and ethereal Oregon landscapes that illustrate this story of Persephone. Each picture is intended to tell a story; each series of pictures (“pinax”) is also intended to tell a story; all of the pictures together (“pinakes”) tell an entirely different story. It depends on who is viewing the images, when and where, as to what the stories are. Persephone’s story is told in text and in an illustrative series of digital fine art photographs created by the authors in a number of esoteric, mystical, and beautiful locations in Oregon. The photographs were taken over the course of an entire year, during all seasons, from the first day of summer 2015 to late spring 2016. A Nikon D-7000 digital camera, 50 mm Nikon lens, Bogen 3411 tripod, and natural light were used to capture all images. Several photos were slightly cropped with PhotoShop to remove a dust spot on the upper margin and all photos were (very) slightly re-sized to make their dimensions more uniform for display. No photos were adjusted for light, color, or focus, or altered or enhanced in any other manner. What you see is, so close as possible, exactly what the camera produced, albeit scaled down from their original 11-inch x 17-inch, 300 dpi (dots per inch) size. Text and photographs by Bob Zybach and McKenzie Peters.